Have you seen the movie, Monsters Inc? I LOVE that movie, the monsters are so interesting and different and then there is the story of course, melts my heart to see those ‘scary monsters’ with that little girl. Anyway, that was my inspiration for this ATC. I coloured them all with Copics, then I texturized the purple one with blender rubbing alcohol sprayed on my stamping rag, previously a washcloth. The result is subtle but interesting. I love how they pop on the black but of course, that presents a problem since their tail, legs and feet are too tiny to cut out. I had already used the copper EP to emboss the sentiment so it was a natural progression to use EP for their legs! I tried to only ink their legs and then I used a tiny paint brush to brush away the excess EP so it wouldn’t show underneath them if you look from an angle. Like the top hat? I originally stamped it in black when I thought that I was going to put some sort of DP underneath the monsters. But when I decided to use the plain black background, I needed to change it. TIP: So I put some two-way glue on a little scrap of paper and allowed it to dry. Then I stuck the hat on it and pressed it into my Versamark ink. Then a quick dip into the silver EP then I heated it with my heat gun and voila! A perfect silver hat! No finger prints or tweezer marks. 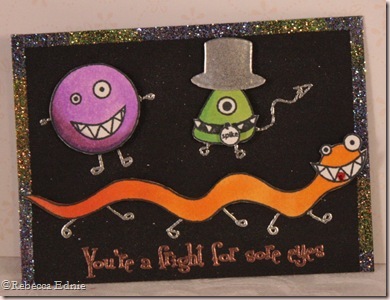 I placed red line tape around the outer 3 edges of the card and applied splotchy, imperfect glitter. Then I tapped off the excess and applied another colour to get this fun border. The purple shows up pretty well in the picture but what looks yellow is really a fun, bright, almost fluorescent green! Very monsterish! Both colours are MUCH brighter in person!! Paper: white CS-Taylored Expressions, black CS, SU! The texture sounds awesome – I wish the photos would show it off better because that is a nifty touch =) The card turned out great!